With our busy and fast pace lifestyle nowadays, most of us barely have time to cook. 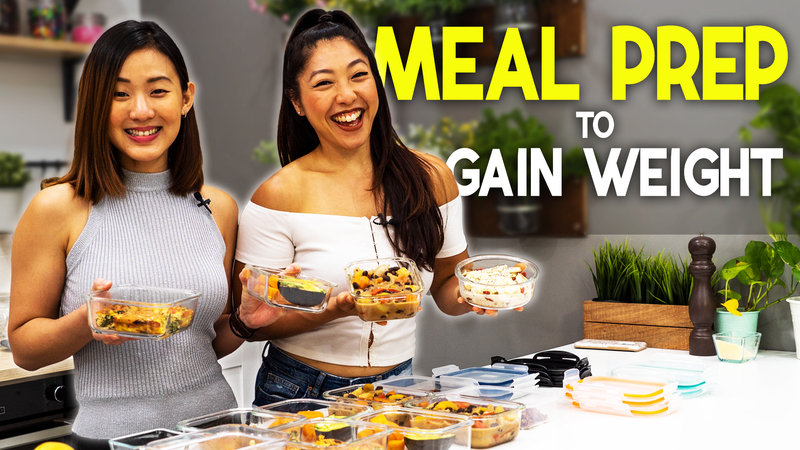 Are you guilty of not planning and prepping your meals and eat out all the time? Eating out frequently, especially when we’re limited to unhealthy food choices can affect our health and also lead to weight gain. If you’re watching your weight and want to eat healthier, you are best to prep your own lunchbox and know exactly what and how much you’re eating. I love sandwiches and wraps as my lunch-to-go because it’s fast, convenient and simple to eat whether you’re in your office, school or even travelling. Unfortunately store bought pre-packed sandwiches aren’t always the healthiest. They then to contain lots of hidden fat and calories from cheese, butter and mayo. I’m going to share with you 3 delicious and healthy sandwich and wrap recipes. All of these take less than 10 minutes to prep, they’re all under 350 calories and high in nutritional values. Sandwiches and wraps are not boring or tastelss. 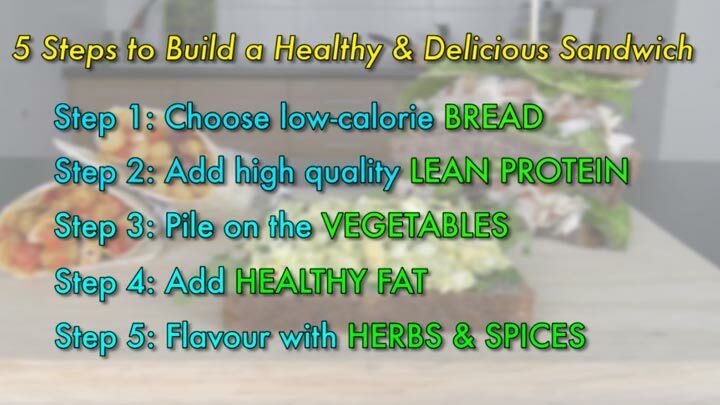 use these 5 steps to build a delicious and healthy sandwich. For portion control, go for medium over thick sliced bread, choose wraps or pita bread which tend to contain less calories over bagels, baguette or rolls. Add high quality lean protein such as grilled or shredded chicken, turkey, tuna, salmon, eggs, tofu, tempeh and more. Be very careful with cold cuts as many pre-packaged “luncheon meats” are loaded with fat, sodium and preservatives. Eating a healthy sandwich doesn’t mean it has to be thin, it fact make your sandwich thick by piling on lots of vegetables. Vegetables will make a more filling sandwich and visually, you think you’re eating a more too, without adding lots of calories. Yes, we should reduce or avoid the unhealthy fat such as butter or mayo. Instead replace it with healthy fats such as yoghurt, avocado, olive oil, nuts, seeds and even cheese. Adding healthy fats will not only add more flavor and texture to your sandwich but it also takes longer for your body to digest, hence keeping you fuller. Of course, they are high in calories, so add in moderation. And finally, add flavor your sandwich fillings with herbs and spices. Instead of adding high calorie sauces, herbs and spices make the food so tasty without adding extra fat. With these 5 basic steps, you keep experimenting with different fillings and won’t be bored by eating the same sandwich over and over again. *Whole Wheat, Rye, Whole Grain or Gluten-Free. 1) In a large bowl combine shredded chicken, cranberries, red onion, tomato and parmesan cheese; set aside. 2) In a separate bowl combine all dressing ingredients; plain yoghurt, honey and apple cider vinegar. Mix until well blended. 3) Next, pour the dressing mixture over the chicken mixture and toss until evenly coated. 4) Place generous amount of lettuce leaves on one sliced bread, add the mixture and sandwich it with another layer of lettuce leaves and bread. 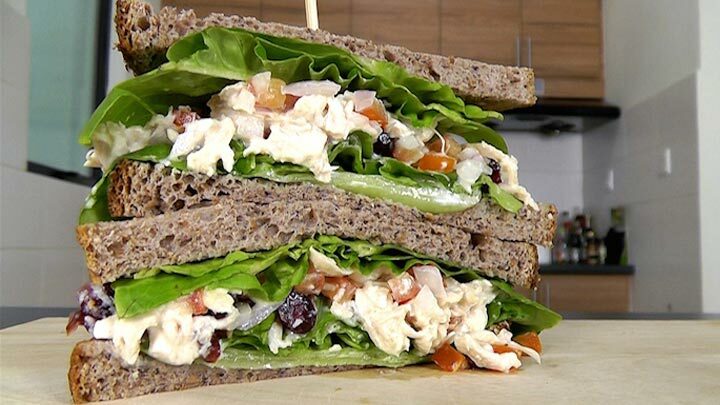 Besides adding more greens into your diet, the purpose of layering with lettuce on each side of the bread is to protect the sandwich from going soggy. Each serving with 2 medium sliced bread contain about 321 calories. The yoghurt dressing is a great mayo substitute to make the filling rich and creamy. I like to combine dried cranberries with savory chicken to satisfy my sweet craving. Try it out! 2) Add onion, garlic and spices; curry powder and cumin. Lightly stir-fry for about 2 to 3 minutes until fragrant. 3) Then mix in the chickpeas, bell pepper, cranberries and lemon juice. Sautee for another 3 – 4 minutes until ingredients are warm and well combined. 4) Reduce to medium heat and toss in the cashew nuts. Season with salt and pepper. Continue to cook until cashew nuts are slightly brown and all ingredients are coated in spices. 5) Set aside to cool down. 6) Take one wholegrain wrap and place one fifth of the filling near the centre. Roll up tightly and wrap it in foil. 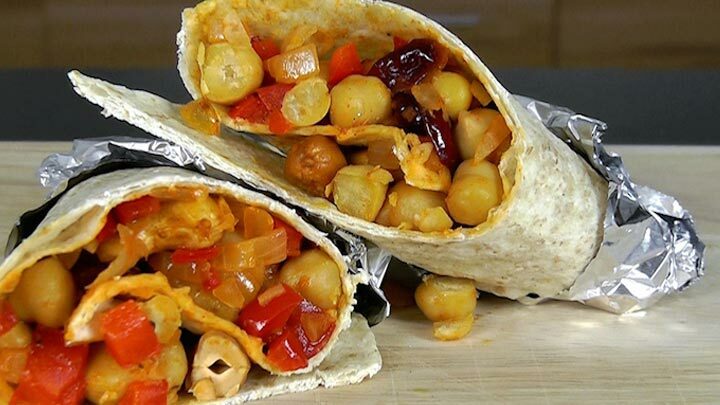 This wrap is bursting with flavours from the spices and contains high nutritional values. You’re getting protein from the chickpeas, healthy fat from the cashew nuts and sweet energy boost from the cranberries. It is great to be eaten both warm and chilled. So make several wraps ahead, wrap it in a foil and store it in the fridge. If you like it chill, then have it straight from the fridge. If you like it warm, then re-heat in the oven before serving. One serving with a medium sized wholegrain wrap has about 306 Calories. If you prefer a creamier texture, you can add the yoghurt dressing from the previous recipe. 1) In a bowl, mash the avocado. 2) Then mix in the eggs, parsley, lemon juice and season with salt pepper. Combine well. 3) Let’s assemble the sandwich. Top a good amount of rockets on the bread, spread half of the avocado egg mixture evenly, then top with more rockets and another slice of bread. Done! 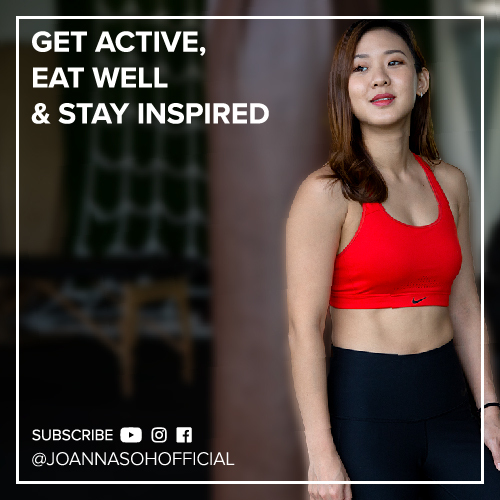 Avocado is incredibly popular among health conscious individuals because it is very nutritious, creamy and rich in flavor, which is perfect to be added in all sorts of dishes. It contains more potassium than banana, it is very high in fiber and packed with healthy fat. On the other hand, egg is a very convenient source of protein. 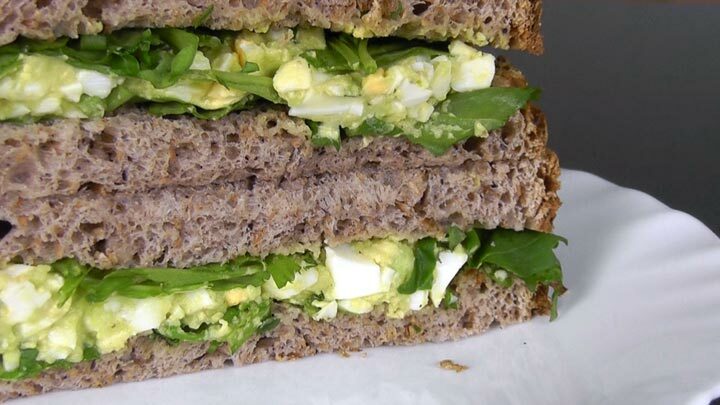 So this simple avocado egg sandwich is yummy, healthy and has about 313.5 Cals. 1) All the filling recipes I’ve shared can be stored in a container and it will last up to 3 days in the fridge. So this makes it very convenient for you to prep your lunch for the next 3 days. 2) To keep your sandwich or wrap fresh, I would recommend either assembling it the night before or in the morning. 3) Or you can pack the sandwich filling separate from the sliced breads and assemble it at work or school. This will also prevent your sandwich from going soggy and you can even reduce to one slice of bread by eating your sandwich open faced. 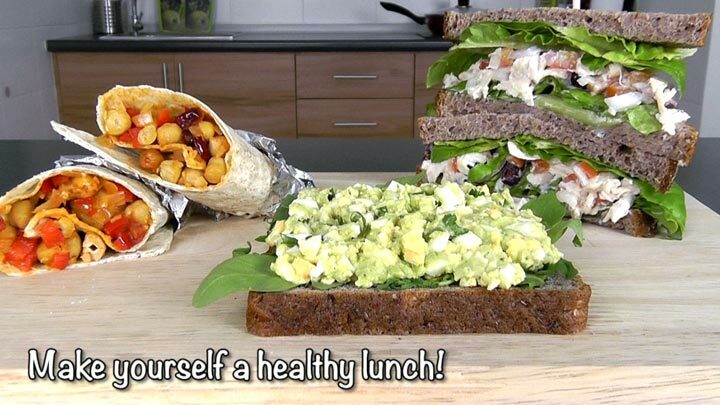 So take a few minutes in the morning or the night before and make yourself a healthy sandwich for lunch. By investing only 10 minutes to prep your meal, you will see and feel the different to your body, health and even save money.